Over the last few days I have been busy stocking up my freezer with vegetables, fruit, pesto, and sauces for the fall and winter. As the weather is getting slowly colder, my herb plants are not producing quite as much, so it has come time to begin pulling my basil, oregano, chives, and more, and turning them into quick sauces that can be frozen and reused when needed. Another favorite is to fill up a ice cube tray with olive oil and add herbs, freeze, then move to freezer proof bags. Come later in the year, grab a herb infused oil cube and add to your soups, roasts, sauces. Instant flavor. 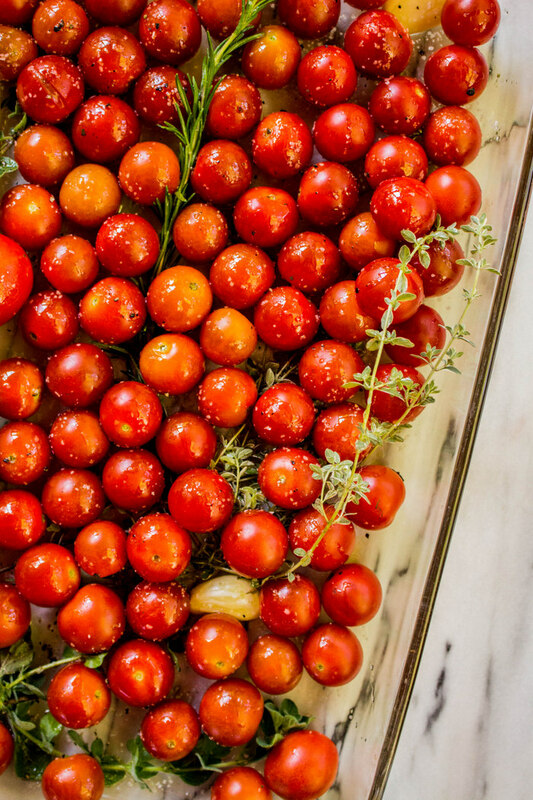 But my most favorite way to preserve summer's bounty is my slow roasting tomatoes with garlic, herbs (like rosemary, thyme, oregano), and adding lots of sea salt and black pepper. Roast until the tomatoes blister. Let cool, then remove the skins. Simply mix together in the roasting pan, and move to freezer proof bags or jars. Throughout the year, then I have instant tomato sauce for pasta, pizzas, and soups. If you need to thicken it, lets say for pizza, simply add a tablespoon of tomato paste over medium heat with the defrosted sauce. This recipe is completely adaptable to you flavor preferences. And honestly you cannot mess it up. Most all herbs work great, but I suggest using one that has more of a wood stem. Unlike basil or chives, as they will burn too quickly. The lovely people at Cappello's Gluten Free sent us several goodies to try. Like their cookie dough! Lasagna sheets and Gnocchi, which we served and loved with brown butter, toasted walnuts and parmesan. We paired their Fettuccine with this roasted tomato sauce and it turned out perfectly. The noodles cook up in 45 seconds and are thick like home made noodles. Now my family doesn't normally eat Gluten Free, but this pasta was delicious and fast. As a mom, that is exactly what I'm looking for in a product. Using a baking sheet, roasting pan, or large baking dish like a pyrex, fill the pan with tomatoes. Toss with olive oil (enough to make them shine) sprinkle with salt and pepper, add garlic and herbs. Give it a good mix around. Then go through and make sure the tomatoes are evenly spread out. Roast for 3 hours until the skin is blistered, slightly darkened and shriveled. Remove from the oven and let cool. Once cool, simply pinch of the skins (this is optional, and will depend on your preference). Remove and discard the garlic and herbs. Mix/slightly smash the tomatoes together. At this point, if the roasted tomato sauce is cool, fill into freezer proof bags. I do a mix of sizes, between 1-2 cups per freezer bag. Just make sure to mark the bag with the quantity, this will help come later when you need the sauce. OR, place in the fridge if using within the next 3-4 days. This sauce is also extremely amazing with goat cheese swirled into the roasted tomatoes and thick pasta noodles. This post was sponsored by Cappello's Gluten Free.